Super Bowl XLVII: Ravens beat 49ers 34-31 after a record return, a blackout, and an intentional safety. Well, that was the weirdest Super Bowl ever. 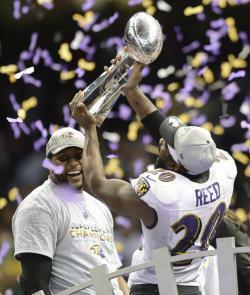 Ray Lewis and Ed Reed of the Baltimore Ravens celebrate following their 34-31 victory over the San Francisco 49ers in Super Bowl XLVII. At 7:31 p.m. Central Time, the Ravens’ Jacoby Jones ran back the second-half kickoff 108 yards for a touchdown. Six minutes after Jones used the stadium scoreboard as a rearview mirror, the Jumbotron went dark along with half the lights in the Superdome ceiling. This was the pattern of Super Bowl XLVII: Something strange would happen, and then it would be followed by something even stranger, and then Phil Simms would salivate about Colin Kaepernick’s arm strength until the next fumble or intentional safety or cloud of locusts. Sometimes the Super Bowl is just a regular game played under a magnifying glass. Sometimes the on-field action is more tedious than whatever talking primate is trying to sell us beer and/or tax software. This year’s 34-31 Ravens win over the 49ers was a showcase for just how bizarre sports can be, and how amazing and terrible it can get when a live event goes off script. For a solid two quarters, the Harbaugh Bowl challenged the Bills’ 23rd-consecutive Super Bowl defeat for most-stultifying-title-game honors. Joe Flacco looked great, Kaepernick seemed shaky, and the action on the field was several notches less compelling than the bottom of Ray Lewis’ gold-and-purple, infographic-and-Bible-verse-laden shoes, which appeared to be a joint project from Under Armour, Jean Paul Gaultier, Bishop T.D. Jakes, and Edward Tufte. And then things got weird. Sunday night’s 34-minute power outage, though not as outwardly goofy as the delay created by the Fan Man paragliding in to a heavyweight title fight, earned extra style points for revealing, now and forever, the shallowness of the NFL’s strategic reserve of pre-game yakkers. With CBS’ Jim Nantz and Phil Simms deprived of electricity, a confused nation got to see the sportscasting version of SpaceCamp, that non-classic film in which a bunch of undertrained kids get shot into orbit to the absolute horror of those in command. When the power came back on, it was clear that San Francisco had done a better job of embracing the process of standing around doing nothing for a half hour. A 28-6 game became 28-13, then 28-20, then 28-23, and—after a break for a short Ravens field goal—31-29 when Kaepernick scored on a 15-yard run with just less than 10 minutes to go. Though Simms’ praise for Kaepernick zoomed well past excessive by the end of the first quarter—no, Phil, it is not remarkable to see a pro quarterback loft a ball to an open receiver—the San Francisco first-year starter has a way of making everyone else on the field look outdated. * On that touchdown run, Kaepernick scooted around left end, then sprinted upfield past Ray Lewis and Ed Reed—the NFL’s future dusting the NFL’s past. Before Flacco grabbed the glory, Kaepernick had a final chance to lead his team to victory. Down five with four minutes to go, the 49ers surged through a Ravens defense that was missing defensive tackle/immovable object Haloti Ngata, who’d been forced from the field earlier in the second half with a knee injury. Kaepernick handed off to Frank Gore for eight yards, then ran for eight himself. After a 24-yard throw to Michael Crabtree, Gore ran for another 33. But then the 49ers stalled: a 2-yard run, a rollout and an incomplete pass to Michael Crabtree, a wasted timeout, another incomplete pass to Crabtree in which the receiver’s head was nearly separated from his torso. On fourth down, the Ravens blitzed and Kaepernick again had no time to run or go through his reads. With no better option available, he lobbed a fade to Crabtree, who was held by Baltimore’s Jimmy Smith. Yes, Crabtree got held. Every receiver gets held on every pass route. This time, though, the referees ruled that Crabtree didn’t get held held. And that’s how the most bizarre Super Bowl since the one with the magnetized helmet got decided, on the kind of conventional football controversy that’s annoyingly ineradicable—a judgment call that depends as much on the ref’s mood as the amount of fabric between the cornerback’s fingers. After that non-penalty, there was thankfully time for one last weirdo sequence. After three short Ravens runs, John Harbaugh ordered his punter Sam Koch to take an intentional safety, sacrificing two points in exchange for running time off the dwindling clock. More than any other play in Super Bowl XLVII, this one revealed that football is a game of unsurpassed athleticism in which that athleticism can be easily frustrated and outflanked. With 12 seconds to go, the Ravens snapped the ball back to Koch, who waited for the marauding 49ers to force him out of the end zone. The Ravens’ linemen, meanwhile, grabbed ahold of those marauding 49ers—the kind of holding that depends less on the refs’ judgment than on their having eyeballs. This was an intentional, ingenious maneuver. The Ravens would either be called for holding in the end zone, the penalty for which is a safety—what Baltimore wanted anyway—or the refs would ignore the blatant tackles and bear hugs, Koch would scamper around for eight seconds, and the game would basically be over. Koch didn’t drop it, and a game in which the 49ers’ quarterback showed he could outrun everyone drew to a close with the Ravens’ punter skipping slowly to his right, stalling for time, and crafting the perfectly weird ending that this weird game deserved.